Rings are one of the largest facets of the jewelry market; from diamond engagement rings to silver fashion bands, they capture consumers' imaginations. Women wear them, men wear them, and teens wear them. Even kids have an inherent desire to adorn their fingers with pretty pieces. Although people began decorating their fingers long before the Medieval period, that is when the popularity of rings began to take off. Even the lower classes begin to wear rings made from cheap metals, such as copper. For officials, the wearing of rings had an executive purpose; they used their signet rings to seal and officiate documents. Government officials, religious leaders, and even artisans and craftsmen owned insignia rings to mark their written documents or goods. Engagement rings had their beginnings in ancient Rome when lovers would pronounce their betrothal with rings made of iron ore. The earliest known offering of diamond engagement rings occurred during the late 1400s among royalty. Today, engagement rings are among the most popular types of rings, from traditional diamond styles to yellow diamonds and other modern looks. There are many different styles and types of finger rings. The majority are made from some type of metal for strength, durability, and beauty. These may be inlaid with gem stones, pearls, beads, crystals, and charms. The metal is often used to create patterns, shapes, or unique embellishments, and engraving is also a common practice to show ownership or commemorate relationships. 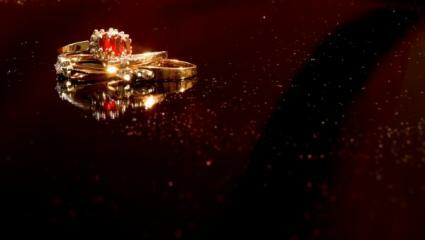 Popular types of rings include engagement rings, wedding and anniversary bands, birthstone rings, and Irish Claddaghs. In addition to traditional engagement or wedding rings, many people now wear bands on both hands and on multiple fingers. Pinkie and thumb rings are often worn as fun fashion trends. Popular looks also include stacked or numerous rings on one finger or many pieces on one hand. Accompanying the trend of personal expression and waning away from classic jewelry standards, body jewelry has exploded onto today's contemporary jewelry scene. Nose, toe, navel, and tongue rings are all widely available in many styles. Depending on the type of ring you are in the market for, there are plenty of places to buy them. Most malls and shopping centers have at least one jewelry store, which is a great place to start window shopping. You can also find less expensive, casual rings at discount stores and through second-hand shops. If you are looking for an antique piece, check out local auction houses, but be sure to check out the dealer's reputation before you buy. Zales is a great resource for wedding rings, like this titanium band for men. eBay Jewelry has a wide variety of rings to choose from, ranging from unique one-of-a-kind pieces to estate collections. Be sure to check the seller's feedback and make sure you are dealing with reputable seller, especially for expensive rings. Kay Jeweler specializes in bridal diamond sets and has an online guide to help you find the right ring. Morning Jewelry features sterling silver rings with embellishments like butterflies and cubic zircons. The Three Graces, based in Texas, specializes in rare antique jewelry and has some beautiful gemstone and diamond rings in stock. For fingers, jewelry is usually sized according to a set of standard millimeter measurements. These sizes range from a 5, which is 15.77 millimeters, to a size 13, which is 22.2 millimeters. Most jewelers will gladly assist you in sizing, or you can find sizing tools online. If your sizing changes or needs adjusted, your rings can usually be altered in 2 sizes either larger or smaller by a professional jeweler.